These few stories are about occurrences that happened around about 1981, in the Liverpool 7 district in a tenement block called Myrtle Gardens, when I was about 12 years of age. 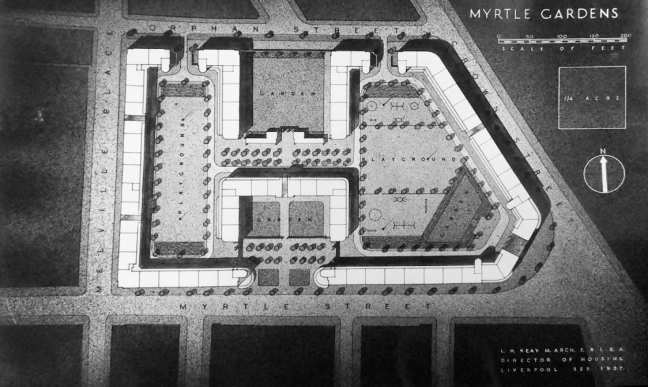 My family moved into Myrtle Gardens in 1979 and quite a number of things happened to myself and my sister Louise. We are a mixed race family and when we moved to Myrtle Gardens there were not many, if any, black families living there. I remember distinctly on the day we moved in a crowd of white children jeering us and shouting, “Ha Ha! You’re moving in to the haunted house”. It wasn’t a house anyway, just a flat. We took no notice of it, thinking they were just being horrible to us, which they were. Little did we know that things were to happen in that place which actually proved them right. This one morning, Louise was about eleven and I was about twelve or thirteen. Louise came running into the kitchen to me as we were getting ready for school. She told me that she had been fastening her shoe laces, with her foot up on the bed, when she heard, rather than saw, something dripping. When she looked down, there were two or three spots of blood on the linoleum. I poo-pooed this, shooed her away and said “Don’t be silly. Go and get ready for school, before we are late”. So, Louise dutifully began to get her breakfast and I went into the bedroom to put my school shoes on where, to my horror, I heard exactly the same dripping sound. I looked down to see three spots of blood on the floor. I looked up at the ceiling, there was nothing – we lived on the top floor of this tenement block, so there was nobody above us. My first instinct was to ask Louise if she had started her period or if she had cut herself, but she said no to both of these questions. I don’t think that I told louise that the same thing had happened to me; we just sort of left it. The blood wasn’t there later, but maybe my mum cleaned it up? My Mum used to work nights in the College of Building to make ends meet; my Dad passed when I was seven. My mum worked at the College, which was an architectural college, until quiet late. So, it was quiet usual for Louise and myself and Edwin, my older brother by one year, to be often left in to our own devices until mammy came home (my mum was Irish and so we called her mammy). There was one night when we children were on our own we had got out the cards to entertain ourselves. We had a rented telly and it needed feeding with a shilling in the back of it to make it work. It wasn’t unusual for the shilling to run out and we would be left bored and so we would get the cards out. This one evening Edwin’s dealing the cards and the house is in silence, apart from us talking. All of a sudden it was as though someone had taken a sprint up the outside hallway and kicked the door with all their might. I jumped out of my skin. Louise looked at me with her eyes wide open. The strangest thing was that Edwin carried on dealing the cards. I said, “are you going to go out and see what that was Edwin? !” and he said “what was?” He hadn’t heard a thing and yet, you couldn’t not have heard it! It was like somebody was trying to escape. There was another instance. The very same scenario, the TV wasn’t on and we were playing cards, I distinctly heard, from the corner of the room, heavy laboured breathing which could only be described as that of an old man. The sound was coming from the corner where the TV was sat on an old wooden table with a little cloth over it and nothing behind it. The sound of this horrible, laboured breathing was coming from behind the TV but nevertheless, I didn’t say anything and was collecting up my cards when Louise looked really frightened at me and said, “What is that noise? !” I replied. “what can you hear Louise?” knowing that I could hear something too and she said “there’s an old man in the corner!” And, with that, I fled out of the room with Louise on my tail, Edwin wondering again what on earth is the matter with us. When we told him the three of us went and waited in the stair well of the tenement block for about an hour and a half, on a really cold night, for my mum to come home. My mum, you know a strict Roman Catholic, just shooed us away and said” don’t be so bloomin silly” and you know, that was the end of that.